Hotel Rajmandir is a sparkling new boutique hotel on the walls of the Golden Fort of Jaisalmer, Rajasthan,India. Six beautiful bedrooms, a stunning rooftop terrace restaurant, wonderful views and a lobby reminescent of the days of the Maharajahs are for your pleasure and enjoyment at truly affordable prices. Located just beside the royal palaces of the Fort, in Dussehra Chowk, the Rajmandir Hotel is a traveller’s gem . Hotel Rajmandir is one or two minutes from Dushahara Chowk, the Royal Palaces, the ancient Jain temples and other attractions inside this amazing fort, including the wonderful variety of shops and the carved balconies and haveli homes of the people whose families have lived here for generations. Hotel Rajmandir has a lovely terrace on the Fort wall, comfortable wicker chairs and great views down into the city. You can enjoy breakfast with the early morning sunshine or late afternoon drinks and watch the stars come out after a glorious sunset. Come and experience the best of Jaisalmer at the Hotel Rajmandir and enjoy being Pampered by the professional, friendly staff and management. We have total 06 well furnished room in our property, out of that we have 01 Standard Room which situated at ground Floor. Standard Room has beautifully designed room in the area of 100 Square feet excluding of Washroom. 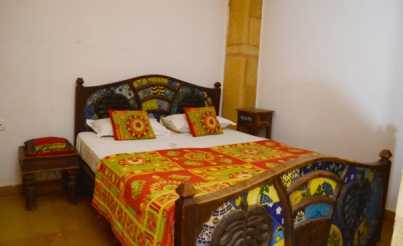 This room is furnished with King size bed with 02 side tables, Split Ac & Chair for Relaxing. Than coming to Rest Room – 24 Hours Cold & Hot water, Shower, Western toilets, a mirror to get your look confirmed & Toiletry. 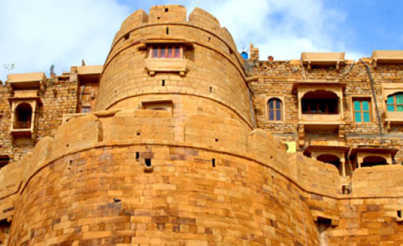 This ancient silk route town was founded in 1156 when Jaisal started to build this amazing Fort on top of a rocky hill. It is a city of camels, desert, sand dunes, oases, wonderful tribal people with heavy silver jewellry, and hardy farmers growing crops enduring the scanty rainfall. Jaisalmer is a city of carved golden sandstone havelies and palaces, beautiful gems of old Jain temples, busy brilliant Hindu temples. 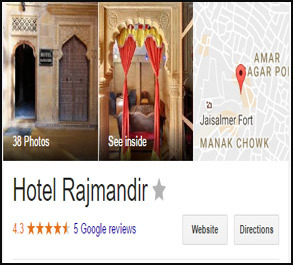 Hotel Rajmandir is a charming, boutique hotel on the wall of the golden fort of Jaisalmer, in the Thar Desert of Rajasthan, Hotel Raj Mandir have stunning rooms, wonderful views, friendly, efficient staff and a relaxing traditional terrace for your breakfast. Hotel Rajmandir has all facilities for your comfortable stay. 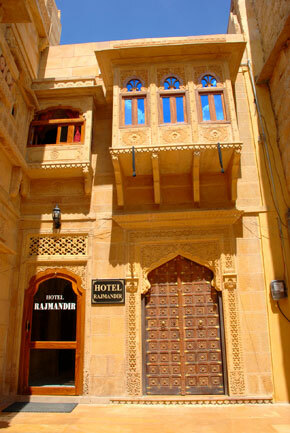 The Rajmandir is a sparkling new boutique hotel on the walls of the Golden Fort of Jaisalmer, Rajasthan, India. Six beautiful bedrooms, a stunning rooftop terrace restaurant, wonderful views and a lobby reminescent of the days of the Maharajahs are for your pleasure and enjoyment at truly affordable prices.